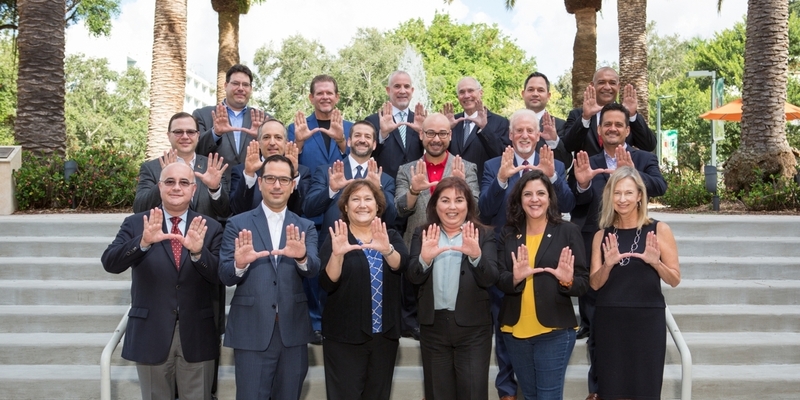 The 2018-2019 Accounting Advisory Board shows their "U" spirit. The Department of Accounting at the Miami Business School has been busy adding up recent achievements to their dossier. Below, you will find the latest updates on the department and its faculty. The Department of Accounting Chair, Dr. Dhananjay 'DJ' Nanda, co-authored a pape r with Shane Dikolli and William Mayew, titled “CEO Tenure and the Performance-Turnover Relation” (2014) in the Review of Accounting Studies is the 2018 winner of the “Notable Contribution to the Management Accounting Literature Award” of the American Accounting Association. The Literature Award committee was impressed by the paper’s important findings, its novelty, and its high number of citations in the literature thus far. The award was presented at the Management Accounting Section Business Luncheon during the 2018 AAA Annual Meeting. Dr. Miguel Minutti-Meza, associate professor, was awarded the 2018-2019 academic fellowship by the Public Company Accounting Oversight Board. This program is designed to appoint, annually, an experienced accounting researcher and academic, with an active interest in auditing and oversight matters, to serve as an Academic Fellow at the PCAOB Washington, D.C., headquarters for a term of up to 12 months. The Fellow is assigned to the Office of Research and Analysis (ORA) for the academic year 2018-2019. ORA identifies and analyzes emerging accounting and auditing issues, and other risk areas that may contribute to audit failures. The Academic Fellow provides analytical support and expertise to ORA and other PCAOB staff. Specifically, Fellows have the opportunity to engage closely with PCAOB staff in the development of research projects and serve as a valuable resource to staff economists. The 2018 PhD Rookie Camp, founded by the Miami Business School Department of Accounting, will be held on December 7-9, at the Miami Marriott Biscayne Bay Hotel in Miami, Florida. The Rookie Camp is the premiere event for recruiting new accounting faculty. It brings together universities that are seeking new faculty members and PhD candidates who are seeking their first academic appointments. The camp is co-sponsored by the Miami Business School Department of Accounting and the American Accounting Association. Additional information about the camp is available at www.rookiecamp.org. The Department of Accounting hosted the fourth annual Florida Accounting Symposium at the Miami Business School on September 14-15. Just over 60 faculty members and doctoral students from seven PhD-granting institutions in the state of Florida attended. The event was organized by the University of Miami, University of Florida, and Florida State University. The 2019 Florida Accounting Symposium will be hosted by the University of Florida in Gainesville (September 2019). Over 100 alumni, accountants, lawyers, and faculty attended. The half-day event provided attendees CPE credit hours plus an opportunity to reconnect and network with business colleagues, accounting alumni, faculty, and friends. The Department of Accounting says “Thank U” to the sponsors of the 2018 ForUM. Gold Sponsors were Alvarez & Marsal, Deloitte, and Royal Caribbean Cruises Ltd. Silver Sponsors were Berkowitz Pollack Brant, Coral Gables Trust, Crowe Horwath, EY, Grant Thornton, HLB Gravier, Kaufman Rossin, KPMG, and MasTec. A Friend of the ForUM was Taxfyle. To read more on the conference, click here. To see all the published papers from the Department of Accounting Faculty and other departments' faculty members, click here.